It's been raining here for two days straight now with no break! Rain is expected to continue till Wednesday. Well, a forecast is a forecast, so I'm hoping it's wrong this time. Fall is our favorite season; the scenery is beautiful, the weather is crisp, fresh and nice, not to mention Halloween! Rain kind of ruins the foliage if it's a lot. 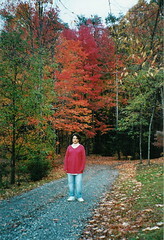 The Sleeves (Tala would say) start falling early before the foliage peak. 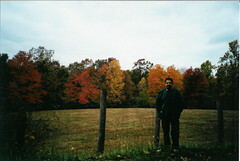 These pictures were taken in New River Gorge in West Virginia, late October '99. The gorge looked like a painting with splatters of all different colors in a nice harmonious way. I have never seen anything like it before. I have a lot of awesome pictures, but scanning them lost a lot, so I'd do with these two for now. Back to the present. I admit, I don't like Ramadan, for many, many reasons. The only thing I like about it is that Eid comes after! Yay, Eid! The kids and I went Eid shopping yesterday... a fun outing we enjoy every Eid. We had a blast and they both were terrific; I guess it's because the shopping was for them not for me! We did quite a bit of driving around, and it was nice to see the foliage and enjoy it despite the rain. We're having Nadia et al for dinner tonight. The menu so far is: Lentil soup, rice, pumpkin stew (we call that Eid stew in Derna and only make it in Eid. It's yummy: pumpkin, raisins and chick peas), pumpkin salad, khushaf, and pumpkin cheese cake. Yeah, lots of pumpkin.. hey, 'tis the season! I made the rice last night at 10:30, khushaf and stew this morning (got up at 5!) Everything is set to put on the table later. This morning, I have a review session for Tuesday's exam. Sometimes I wonder how I manage! Halloween decoration is up. We did them on Wednesday. As soon as Halloween is over, Halloween flag comes down, Eid flag goes up. Actually, we're getting better and better every year at the decoration. MFN was the Emperor's New Groove-- a good laugh, really. Back to work now. Hope it clears out and the nice weather comes back. Tala would say: "The clouds are letting the sun out!"